Florida is famed for her gorgeous beaches. However, soft white sands that feel like you are walking on talcum powder and green water that shimmers like emeralds can only be found on the Gulf Coast. Destin is one of the beautiful places that holds these special beaches. When vacationers choose Destin, they are saying ‘yes’ to the best that Florida has to offer. When they choose a vacation home in Emerald Shores they are saying ‘yes’ to gorgeous stucco Caribbean-style homes. 94 homes are located in the community. There are also two community pools, a grill, tiki bar and showers and restroom facilities. However, the main draw is the beach, right? The guests here enjoy a private beach with its own pavilion area. No need to dredge back to the house to take a shower and eat. No need to pack up the little ones when they have to use the ‘potty’. Everything is right where you need it. If you family tires of the beach, there is still plenty to do. Splash and play in the two community pools. Play some shuffle board with your spouse. The kids can enjoy a game of basketball or tennis. 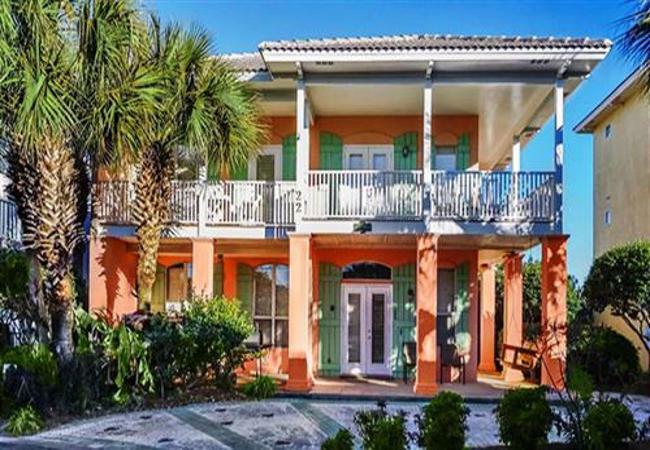 In nearby Destin guests can shop, dine or drink wine. Have a lobster dinner at one of the seafood restaurants. If seafood isn’t what you want, don’t worry. There are plenty of dining options. Bars and entertainments abound in this area. Of course, the silky, cool water is what visitors come to Florida to enjoy. Clear visibility in deep water is perfect for spotting marine life such as dolphins and rays. Scuba dive, snorkel or grab a boogie-board and enjoy the waves. Anglers will enjoy great sports fishing here. Catch cobia, flounder and spades in the warm gulf currents. Take a glass-bottomed boat ride. Try your hand at paddle-boarding. There is so much to do in Destin. Your only problem will be finding time for everything. Enjoy beach-themed decor and colors, amazing views, and fully-stocked kitchens. Pull out sofa-beds and built-in bunk beds assure everyone a comfortable place to sleep. Who really sleeps on a vacation, though? As soon as that gorgeous sun rises over the ocean, everyone will be ready to hit the beach for a day on or in the water.